According to a report from Korea, LG Display acquired an OLED CVD deposition system from Korea's Sunic System. The new Gen-6 system will be deployed at LGD's upcoming E5 flexible OLED fab in Gumi. Interestingly, the Korean report says that LGD's first choice for OLED deposition system was Cannon-Tokki, but the Japanese company could not supply the system in time as it has a "rush of orders" from Samsung Display. LGD is hurrying to build the new fab as they aim to start production in the first half of 2017. Of course the report suggests that Apple aims to adopt OLEDs in its iPhone in 2017 or 2018 - and so it is rushing its suppliers LGD and Samsung to be ready with the flexible OLED capacity Apple requires. LGD's E5 fab was announced in July 2015. The E5 is a 6-Gen (1500x1850 mm) flexible OLED fab that will be located at LGD's Gumi Plant and will have a capacity of 7,500 monthly substrates - or 1.5 million 5.5" panels. The new fab is scheduled to begin mass production in the first half of 2017 and will cost around $900 million. LG currently produces plastic-based OLEDs in its Gen-4.5 fab, with a monthly capacity of 14,000 substrates (more than double its capacity in the beginning of 2014). 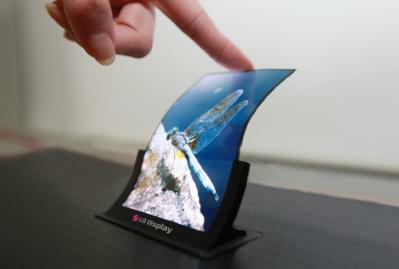 LG Display's flexible AMOLEDs are used in LG's mobile phones (the G Flex 2), wearable devices (such as the Watch Urbane) and in Apple's Watch.